Neill shares some personal experiences and advice on how to create fabulous floral decorations for a luxury wedding church ceremony and how to work with the venue, the bride and the brief. Green, white and soft peach is the colour theme to harmonise with the colours of the church. Whether a ceremony follows tradition or a unique and personal script, deciding where to exchange vows is often related to the bride’s upbringing and home location. And if she is getting married in church, the architectural elements and the kind of ceremony held will impact on the choice of floral decorations. 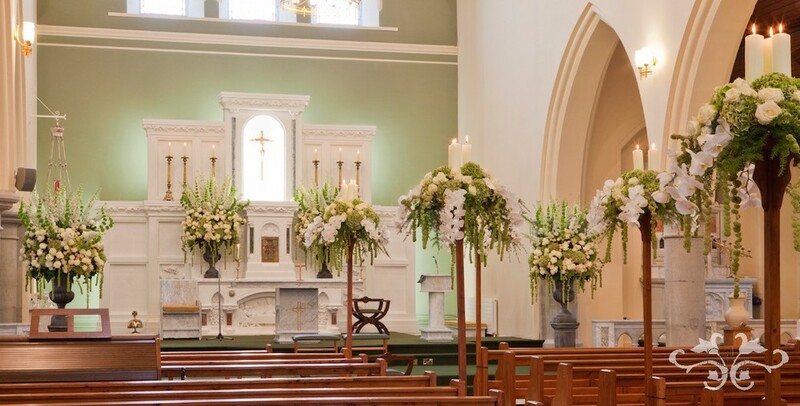 Gothic arches inspired lavish floral decorations with church candles floating high above the pew ends to line the aisle. Wherever a ceremony is held, we always decorate it to welcome and celebrate. Notwithstanding the bridal bouquet, the flowers at a ceremony convey a mood of freshness and abundance, and although the ceremony might be quite short – usually less than an hour – each decorative element must contribute to the moment. Two tall arrangements offer an alternative to the traditional floral arch. Delphinium, Agapanthus, green Hydrangea, peach Spray Rose, Avalanche Rose, Carnation and Eucalyptus on a pillar construction of Contorted Hazel. Decoration should focus on the places where the eye is drawn: the entrance, the aisle and the altar. How, and how much to decorate each element depends on the budget as well as the site. Scale too is important as is the amount of natural light. But before you begin planning the ceremony check with the venue if there are any restrictions. From my own experience these may include using candles, attaching flowers to pews, or indeed time restrictions if it is a particularly sought-after location. Magnificent pew end arrangements with lighted candles bring your eye up the aisle to the altar. Unity with the bridal theme is also a factor in creating bespoke designs for the ceremony – as sometimes they can be transported and used again for the Wedding Breakfast, so bear in mind what could work on both occasions. Two imposing urn arrangements at the alter repeat the flowers used for the church entrance, with the addition of Amaranths and the "Irish Bells." The brief for this Irish country wedding, pictured here, was for a sense of elegance and the colour palette was soft pastels and green; reminiscent of the Emerald Isle. It’s a fresh, timeless aesthetic created by incorporating white Phaleanopsis Orchids, white Avalanche Roses, pale peach Spray Roses combined with Hydrangea, Delphinium and Amaranthus. The entrance lent itself to two imposing arrangements flanking each door, garlanded and graceful, yet also giving a sense of what was to come. They were also a nod to the trend for incorporating trees into wedding designs, giving the feeling of a pastoral idyll. Close up of the tall arrangements at the church entrance. See how the peach Spray Rose picks up the peach hues of the Hydrangea. The many different tints and tones of green add depth and elegance. The eye was led up the aisle and we used the impressive height of the church to great effect by creating tall arrangements attached to intermittent pews and serving as elaborate candelabra. The restraint of the actual chapel architecture was respected in this design and the brief to be impressive but not overly fussy was in keeping with the bride’s own character. Long trailing stems of Phalaenopsis Orchids add elegance and opulence. The Rose petals reinforce the eye to lead to the altar. A perfect balance of elegance, opulence, romance and beauty. The altar was more abundantly decorated with urn arrangements and the colours blended perfectly with the church decoration; so much so that one guest wondered if it had been repainted especially for the wedding! View of the altar taken from the rear balcony. Groupings of Avalanche and Spray Roses are in proportion with the large heads of Hydrangea. We also made full use of the balcony feature by creating an overhanging runner of flowers and foliage. Of course, no wedding is complete without the romance of some freshly strewn Rose petals in complementary shades as a finishing touch. The lavish floral feature on the balcony continues to bring one's eye up towards the high ceiling, accentuating the elegance of the church. Against this setting, the vows were exchanged and guests remarked on the unity of music, emotion, scent and flowers that made a lasting impression. So if you're planning your own church wedding and would like some advice on how to design the floral arrangements, give us a call or pop into the store and we would love to discuss ideas with you over a glass of Champagne of course!